“ "It's fantastic. I can't say how much this means to all of us." All of the designs are based on actual modules and rockets. Of course, I can't do it perfectly, but I am trying my best. Also, I am doing it without any mod parts, but I suggest using the part welder plugin to reduce lag. Zenith - top side of the ship; usually oriented away from the orbited body. Nadir - bottom side of the ship; usually oriented towards the orbited body. Some of the parts of the station like the Nodal Module have not yet been launched. 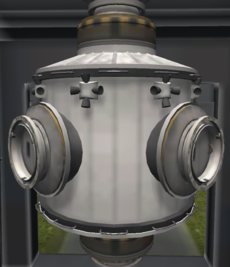 The proton rocket family had 7.4 meter diameter fuel tanks but we do not so I just used 4 large sized tanks to make the diameter 7.5 meters but however this causes problems as it has nothing surrounding the small tanks, so I used a few Modular Girder Segment XL to connect the boosters to the inner part. Since all the rockets in the Proton rocket family are so similar they will be used interchangeably in this tutorial. This is the layout for the Rockomax Jumbo Tanks to make a Proton family rocket. The black lines are just for reference. This is the American launcher. I'm trying to make a replica that is flyable and dockable. Unfortunately, it used a mechanical arm to dock modules, a thing we don't have. Alternatively, you could use the stock Learstar A1, which closely resembles the Shuttle. The Learstar still needs some items (such as the parachute) which aren't on the craft. The Learstar, however, also includes cargo bays which make it easier when transporting cargo. The Falcon 9 was developed by SpaceX and resupply the ISS with the Dragon capsule. The payload in real life is supplies but as kerbals need no supplies to live you can use it to send up fuel, solar arrays, science, or a tug. SpaceX is developing the Falcon Nine to be reusable. The first stage will fly back to the launch pad while the second stage is doing an orbit and then return to the launch pad. The Dragon capsule is along with the Soyus the only vehicle to return back to Earth intact after the retirement of the Space Shuttle. A Soyuz rocket is another Russian rocket used to launch the manned Soyuz craft mainly but was also used to launch the Pirs docking compartment and airlock. 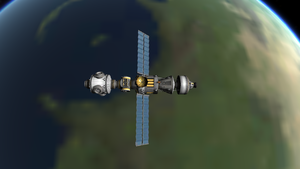 Progress is an unmanned Russian resupply ship the routinely sends up supplies to the station as kerbalnauts need no food you can send up fuel and/or spare parts. You can add an extra fuel tank(s) or solar arrays if you want to actually send up stuff and not just let it be there. The three adapters are meant to look like progress and are NOT meant to do anything. A soyuz can carry three Cosmonauts to the station at a time. Cygnus is a craft made by Orbital Sciences contracted by NASA. It is launched by the Antares rocket. Dragon is launched by SpaceX with their Falcon 9 rocket. Zarya (Dawn in Russian) or FGB (Functional Cargo Block) was the first module of the ISS. FGB Zarya initially provided flight control as well as electricity and fuel supplies. Now, it is mostly used for storage. It is the connection between the Russian and American side of the station. The original Zarya launch happened on November 20, 1998. I can't find the original orbital information The module was placed on a Low Earth Orbit, which usually corresponds to 160 to 2000 km. The current ISS orbit is 402 km PE × 424 km AP with a 51.6° orbital inclination. So, if you want to make it good, launch as usual, with a gravity turn starting at 10 km. Turn towards 38.4 degrees (the 51.6 inclination). Continue until you reach 424 km apoapsis, then burn there to get 402 km periapsis. I'll have to test myself if it's possible with the current Proton-K design It is possible to achieve this orbit with precise flying or an autopilot. It leaves 60% of 3rd-stage fuel and a full on-station tank. When you have the stable orbit, open the solar panels and the antennas. Move the station to orient it the good way (the one radial docking port facing the Earth; the HubMax towards your prograde vector). Transfer any fuel or electricity (if you are in the dark zone) then either undock the third stage or keep it until the Zvezda mission. There you go, the ISS begins to exist! Unity, also known as Node 1, is the first American-only module on the ISS. It is basically a connector between many parts of the station. It was delivered with two PMA (Pressurized Mating Adapters), one that is permanently placed between Zarya and Unity, and the second has moved many times since its installation. NOTE: : I made a little mistake, because the PMAs are supposed to be moveable. Check lower for info. The original launch happened 2 weeks after deployment of Zarya, on December 4, 1998. For my launch, I had to use the Proton-K launcher, because there isn't any solid fuel boosters as powerful as was used by the Space Shuttle. It had two boosters, each at 12.5 MN while the Rockomax booster has only 300 kN (2.4%). Try your best to put it on the same orbit as Zarya. If you have an auto-pilot, use the "Launch to rendezvous" function. If not, try to send it with Zarya at a 45 degree LPA. Once again, the orbit is 424 km AP × 402 km PE. Check the tutorials on rendezvous and docking if you don't know how to. The goal is to attach one of the PMA ends (front or aft, they're symmetrical) to the Hubmax (front end). You may need to switch between vessels to put them in the right diretions. On the actual mission, there were 3 EVA's to connect cables between the modules, and once to enter the ISS. As of 0.19.1, you can only do that last point. If you brought any Kerbonauts, put them in EVA and let them enter the Hitchhiker. After some time, get them back on what's left of your launcher. I didn't use a manned pod, so I just dropped the launcher with as less fuel left as possible. Instead, try to return the Kerbonauts on the last stage of your Unity launcher. You can pump the fuel from the Zarya launcher if it's still docked; you'll also need the aft docking port of Zarya for the next mission. Possibly a lunar base? Let your imagination run wild! This page was last edited on 1 September 2018, at 16:20.